In today’s world media represent a powerful and influential tool of spreading information and forming public opinion. Studies of the media sphere, including news and analysis, as well social networks, became an independent field of research. According to the statistics, Malaysians access Internet for about 5 hours daily, where 3 of them are spent on surfing social networks. Out of 30 million population in Malaysia, 19,2 million people are Internet users and 15,6 million of them are Facebook members. Based on recent research, Malaysian Facebook user has 200 contacts in his friend-list on the average. According to the research conducted by the Pew Research Center, 67% out of 18 millions of Malaysian Muslims were against ISIS, 12% were supportive and remarkable 21% were hesitant to give an answer. From another interesting findings of this research is that 6% of Malaysian Buddhists also expressed support to ISIS activities. Considering the sociopolitical realities of Malaysia, the rising wave of extremism in the region, and the statistics brought above, media turn to be an important tool of enlightening the nation and spreading the positive narrative. Media have always been the voice of public conscience, especially during the times of crisis, and there is an expectation that they would play a significant role in tackling extremism and terrorism. Telling the true stories about religiously motivated terrorism and informing the nation about the true nature and the environment in which terrorists operate is one of the important responsibilities of the media. At the same time the governments are trying to introduce their own limitations for the network users in order to fight extremism on the digital playground and sometimes the border between the freedom of expression and the fight with aggression, discrimination, and provocation of public anxiety becomes infringed not in favor of the citizens. Therefore, here is the question of where does the subtle border between the freedom of expression and the regulations necessary to prevent provocation of public fear, aggression and discrimination and the spread of extremism lie? One can observe the trend that some self-arranged Malay speaking groups are trying to tackle the Wahhabi type of thinking through the means of social networks, Facebook in particular. In the meantime the other groups that instead promote the extremist thought also appear numerously. With the spread of activities carried out by the terrorist groups in the Southeast Asia, especially their efforts to absorb more supporters through the means of social media, the Malaysian government also emphasized on the necessity to use the social media channels to counteract those trends. Heavy punishments for the social networks users, who are leaning towards the extremist thinking and carry out the according actions, were legally enforced by the new law. What are the boundaries for the media to cover on extremism related topics? What is the role of the media in forming a positive narrative for the intellectual health of the nation? Can media play a role in preventing people falling for extremism? How the legal boundaries for the regulation of media work regarding prevention of extremism must look like? 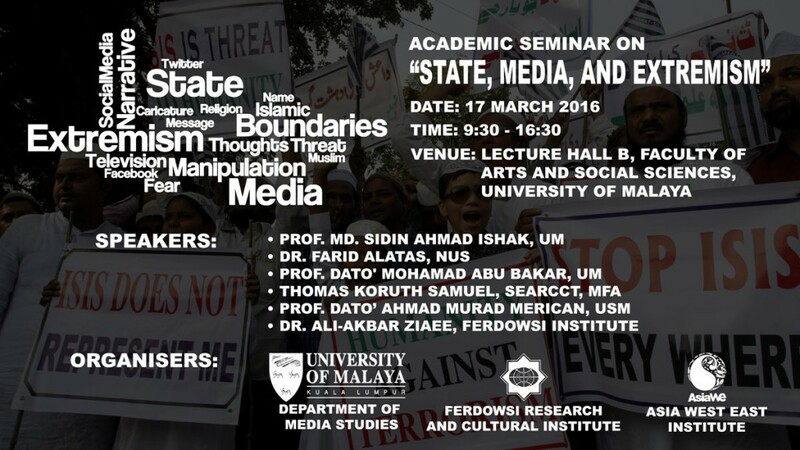 What is the role of academia in projecting a moderate narrative to the media? What is the interaction between academia and media in this regard? What is the role of media in preventing religiously motivated extremism?